Two treasures of disparate worth are waiting to be plundered within three different environments: the Frosty Mountains, the Tangled Jungle and the Lava Cave. The mere existence of treasures and challenging locales is clearly a call for adventurers. (Ahem, that’s you.) Players assemble a team best suited to capture the objects of their desire. And beware of Goblins! They want a piece of your hard-earned loot. 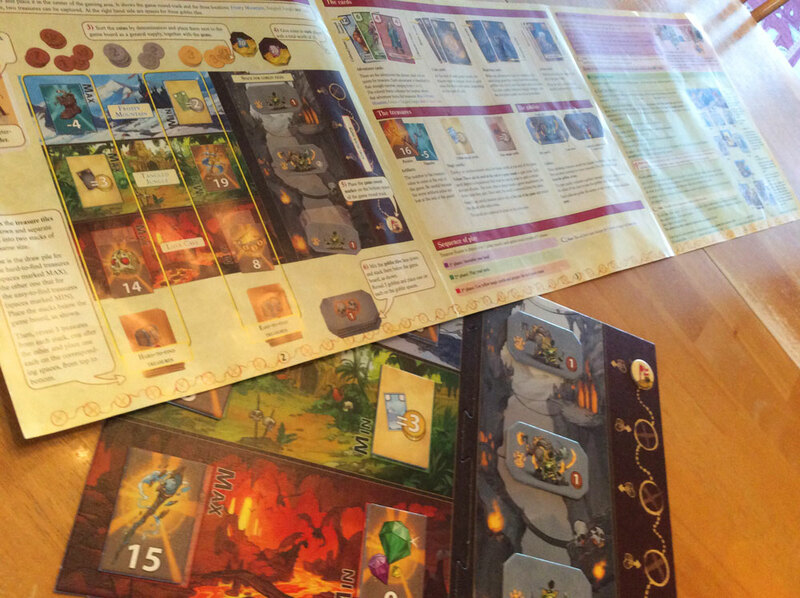 That’s the thematic set up to the excellent Treasure Hunter board game from Richard Garfield. 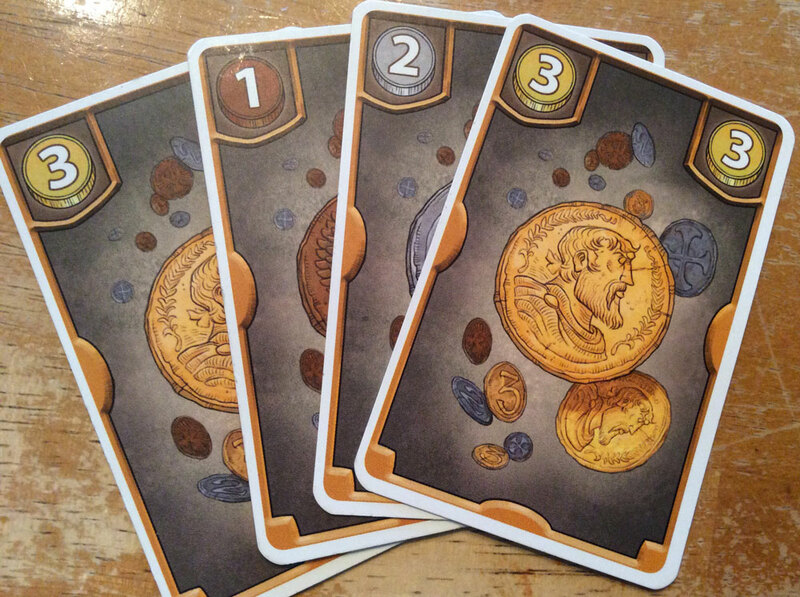 Players have five rounds to amass as much treasure as they can, while also protecting their coins from pesky goblins. Each round begins with two random treasure tiles placed into each of the three environments. 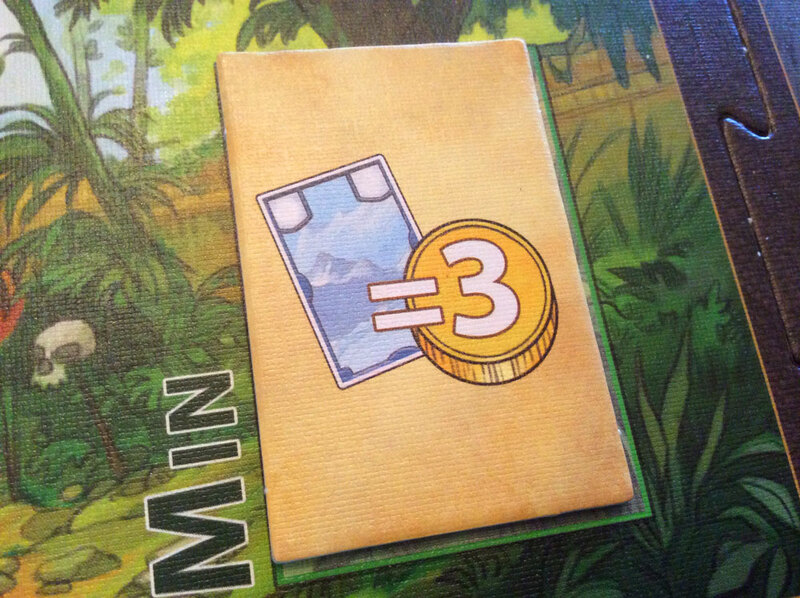 One treasure will be placed in the “Max” spot, and the other tile will be placed into the “Min” (or minimum) spot. There are 54 treasure tiles to behold, and the mix includes positive value treasures ranging from 1-20 and negative values between -3 and -8. Slightly less than half the tiles are magic scrolls (more on those later). With the treasures laid out the players each get a hand of nine cards and begin crafting devious schemes to secure the best treasures (like the golden dwarf statue worth 20 points) while avoiding the junk (if any made it to the table). Nobody will be gunning for an old nasty boot worth -4 points, and everyone will stop at nothing to avoid the morale-sapping -8 rotting monster egg. It’s time to begin drafting your adventurers and action cards. That is to say you’ll choose a card, pass the hand, choose a card, pass the hand, choose a card, pass the hand, choose a card, pass the hand, choose a card, pass the hand, choose a card, pass the hand, choose a card, pass the hand, choose a card, pass the hand, choose a card and pass the final card. That’s nine cards total. For the uninitiated, that’s called card drafting. No one knows what you’re holding, but as the hands move around the table, everyone has an imperfect idea of what’s available and the cards being selected. I have — perhaps — an unhealthy relationship with card drafting. I’m glad you asked. I do love it so. The Flaming Sword brings the total to 13 towards the Lava Cave treasures. So what’s the deal with the Max and Min treasures? When the drafting part is over it’s time to play your first cards. 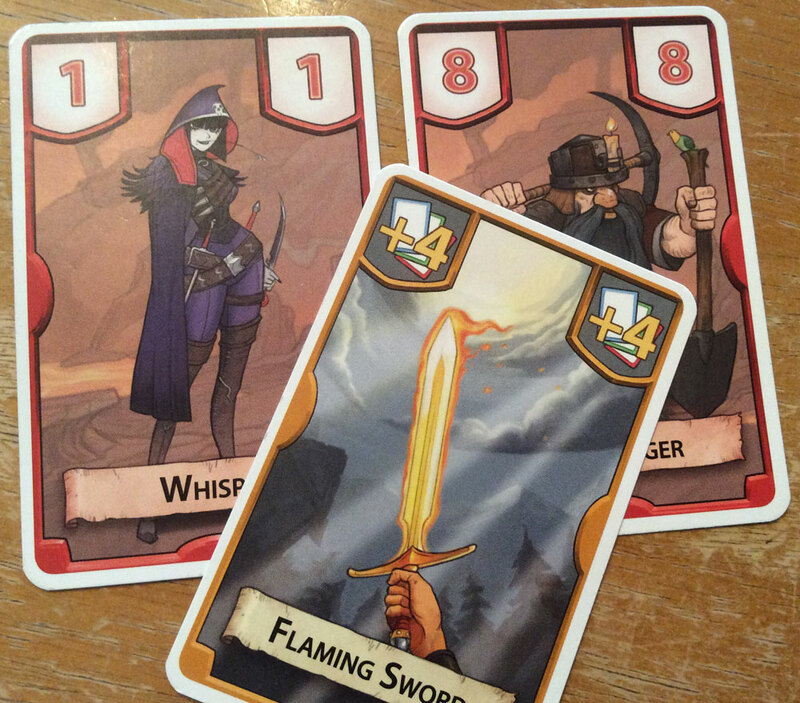 All players reveal their blue, Misty Mountain adventurer cards simultaneously and resolve the region. That’s followed by laying out all the green Tangled Jungle adventurer cards, and finally the red cards for the Lava Cave. The player with the highest sum of adventurer cards in each area gets the Max treasure, and the person with the lowest sum gets the Min treasure. As far as the adventurer cards go, each colored region has cards with values ranging 1-12. If you are a mathy person, know that there are 75 cards in the deck. In a four-player game, 39 cards will not be in play each round. Within the draft mix are various action cards to supplement your adventurers and induce varying degrees of disdain and passive aggressiveness around the table. Once all the adventurers of a given region are out and tallied, people can begin laying down action cards to alter their totals. You may have thought you were the proud new owner of a shiny new ruby ring, but your “buddy” decides to play his Flaming Sword, insulting your drafting skills with an instant +4 to his total, boosting his sum above your own. Similarly, you may be aiming for the sparkling crown sitting in the Min slot. You’re confident that your lone two-value adventurer is a lock, but your buddy who played cards totaling three points decides now is a lovely time to experiment with drugs and chugs a Shrinking Potion. Doing so reduces his total by two, thus securing the Min treasure with a grand total sum of one! By the way, Smart Guy, you can’t secure the Min treasure by playing zero cards. You have to have at least one adventurer card in play to be eligible. Also, you can’t hold back cards you drafted for a particular region, meaning when you’re in the green jungle area, you have to play ALL of your green cards. Draft responsibly, friends. Coins — What’s Chris Doing? If you want to avoid some of the drama transpiring in the struggle for treasures, Treasure Hunter provides the temptation of straight up, unadulterated coinage within the cards you’re drafting. Will you snag a few three-point coins or draft adventures to grab that six-point treasure in the Lava Cave? But what’s Chris doing over there? Is he taking coins, too?! You’ll never know until the draft is over! Yeah, he was taking coin, too. Figures. You may be thinking that Treasure Hunter is complete as already described, but there’s an extra phase each round that’s like a game within a game. I’m talking about the Goblin phase. 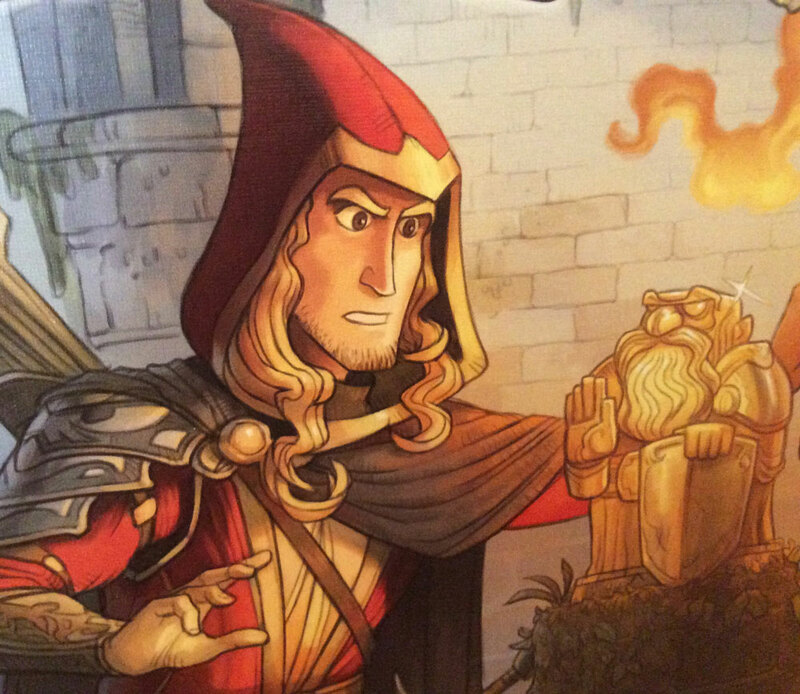 It’s not enough to draft adventurers to claim great treasures or avoid bad ones. You need to prepare for (or ignore, if you consider the loss to be manageable) a random selection of goblins that are laid out alongside the treasures at the beginning of each round. Goblin tiles include a number of “Paws,” which is the value of dogs you need to avoid the coin loss for each goblin. If you are the best at drafting dogs each round, you can grab some or all the goblin tiles for points. So are you going to draft canine guards, adventurers or action cards during each draft? Those goblins can be pretty nasty, and you may be on course to lose seven coins this round. Will you be able to offset that with treasures? The constant balancing and decision-making in this game is nothing short of pure entertainment. This goblin requires three dog paws to avoid losing 1 coin at the end of the round. Behold the rather large, floppy rule book in all its glory. 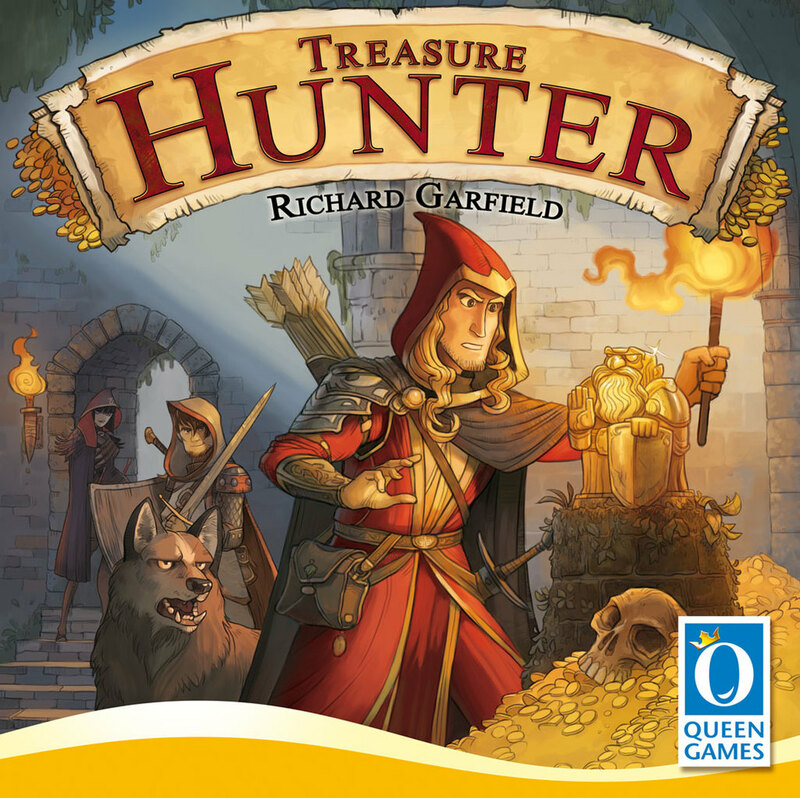 How well you anticipated, outsmarted and out-drafted your opponents, and your ability to capitalize on your spells while avoiding major losses via the goblins will determine the winner in Treasure Hunter. That and a little luck. I find the entire exercise of choosing adventurers, action cards, dogs and coins in the draft to be incredibly fun and stimulating. If you’re staring down your opponents, snickering and raising eyebrows while you do it, all the better. Drafting is followed by the entertaining steps of resolving each area when everyone may or may not be messing with their sum of adventurer cards. That’s topped off with the fast-playing goblin phase. Treasure Hunter really blew me away. It’s light on rules, but heavier on strategy than it first appears. It’s a game I want to play over and over again, and I am pained to think of any negatives to share about this game. I can’t even toss you a bone and complain about the components. 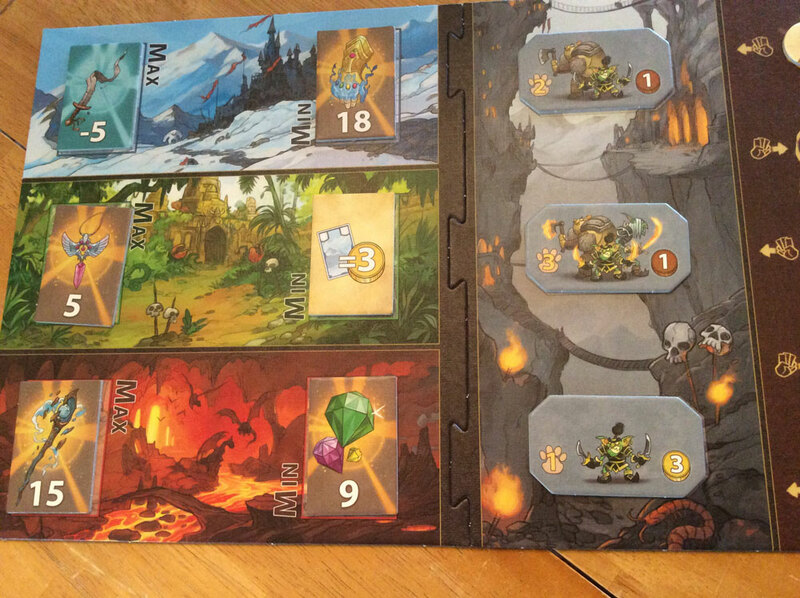 Treasure Hunter sports nice, beefy cardboard pieces, and the cards are of commendable quality, too. Okay, fine. If I have to say something bad it’s the size of the rule book. Let’s just say it’s the same dimensions as the game box, and that makes it just too big and floppy. (That’s what she said?) It’s also tri-fold and is about the length of a Letters From Whitechapel game board when opened. If you want to keep the rule book handy, it’s best you set up a side table. So what I’m really saying is this game is nearly the boss of all games I’ve played in a while, and I think you should take a good look at bringing a copy of Treasure Hunter (and it’s floppy rule book) into your home.